We saw quite a lot of Memphis in just a little bit of time. Barbque? Check (and in case you are wondering, Corey had a grill portabella sandwich smothered in sauce). Graceland? Sun Studio? Two more checks. We also saw a few ducks hanging out in a hotel lobby, strolled down Beale Street (refreshingly not family friendly, but we are a family so it was a short time for us there), and took the monorail over the Mississippi to Mud Island. If Mud Island sounds terrifying, like the last place on earth where dinosaurs still roam, it is not. It is actually a cool blend of museum and interactive outdoor sculpture i.e. a miniaturized Mississippi that you can walk from Cairo, Il to New Orleans. Even in miniature form it takes about fifteen minutes to do. But Graceland is what most people think of when they think of Memphis and it is Graceland we went to first. We honestly had no idea what to expect. Two big surprises for me. 1) The house actually felt pretty normal. Not even that big. 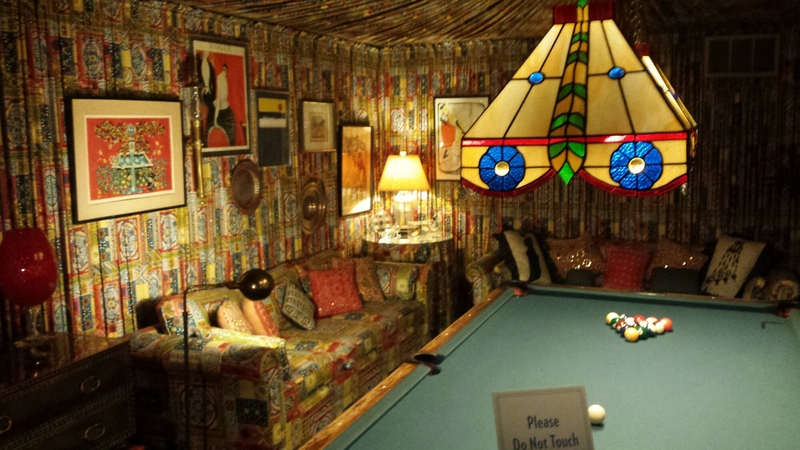 It is like 13,000 square feet and has over 20 rooms, but inside it felt more Brady Bunch than Rock and Roll diva. 2) I really liked Graceland. Actually wish we spent more time there. Yes, it is an extremely sanitized look at the King of Rock. But man, when is the last time you walked through a hall of hundreds of mounted gold and platinum records. And the jumpsuits! Man, Elvis had style. As cool as Graceland is (and it is pretty cool), Sun Studio is even cooler. This is where Elvis first recorded. It is also the studio that first signed Johnny Cash, Howling Wolf, B.B. King, Roy Orbison, Carl Perkins, and Jerry Lee Lewis. U2 also recorded some of Rattle and Hum. A small, homey place, you get to do things like hold the microphone that Elvis and others used to change America and the world forever. Tickets are only $12 an adult and children under 12 are free. Very Hennacornoelidays recommended. I also wrote up a few articles for Splash. If you are interest in reading them, here is the Graceland article (with a few more cool photos) as well as an article about Sun Studio. We also recommend staying at this Airbnb located in the hip Cooper-Young neighborhood which is, by the way, what Brooklyn would look like if it relocated to Memphis. This entry was posted in River Towns and tagged Cooper-Young, Graceland, Memphis, Sun Studio by hennacornoelidays. Bookmark the permalink.